Club Penguin Cheats by Mimo777 Club Penguin Cheats by Mimo777: Club Penguin PINS are IN THE GAME! I know a few of you have seen this but it is worth discussing and theorizing. It is interesting to us how Club Penguin picks their PINS. At times, the PINS are a foreshadowing of new things to come on Club Penguin. For example, remember the Snow Flake Tile Pin? And right after that, they released the Card Jitsu with the Snow Flake on it. Anyways, now Club Penguin is getting their PIN ideas from inside the game. Here is the latest example. 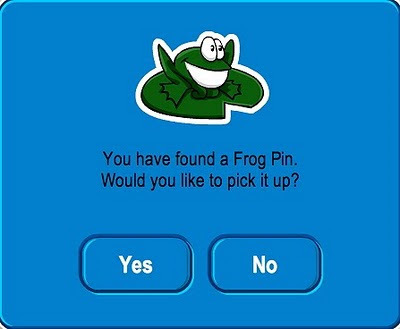 The very last Club Penguin Pin was the Frog PIN. Does that frog look familiar? Sure it does! It's from the Club Penguin game Hydro Hopper! Now the Puffer Fish PIN looks a little like the Puffer Fish in the Aqua Grabber game but it is not exactly the same. Can you think of another example? What do you think Club Penguin is up to? Hang out at my exclusive Club! Mimo's Virtual Lounge! I honestly have no idea what Club Penguin is up too. WUT SERVER R U ON?!!! Maybe we can predict the pins??? Hmmm. Wierd! Maybe the next pin could be a puffle or the giant squid, they are both in puffle rescue! That's because they're running out of ideas. Also you guys DIDN'T notice it was from the game? What about the shrimp pin. there is shrimp in Pizzatron..
Hey mimo! I knew that pin looked familiar Ok so heres a list of some pins I found that are in Club Penguin games! NO! HERBERT IS A SUPER VILLAIN! AHHHHH! Lol! That would be cool. But, would the pins ever change? Maybe! A puffle pin! That's SO cool! What if Club Penguin had a Herbert pin? That would be awesome. Then the next day, there will be a new mission! Mabe they are upgrading the games. It could be possible, plosible, or imposible. Yeah I noticed that to. Hey Mimo! I just want to show you something. Did you realize that the Frog Pin was at The Dock? That is exactly where Hydro Hopper is! Club Penguin must be up to something! Most of the times, they put the pins in the game! I'm sorry if this is long. I believe it has something to do with the squid.Mabey herbert(and klutzythe crab or whatever XD) teams up with the squid in the plan about the puffles or something? how about a puffle pin (puffle rescue). or even a puffle pin of each color of the place where they celebrate during the puffle party. Isn't that great? ~~~~~~~~~~~~~~~~~~~~~~~~~~~~~~~~~~~ thats sorta weird dont you think eh? Idk but dont type in cape! Mimo there is a toy out called Herberts Drill Vehicle i just wanted to let you knoww! Btw Mimo, alot of people already knew that. But, another example would be the taco pin from the Fiesta Party. Or the Wagon pin for celebrating the orange puffle. Also, the Buckle Boot pin from St. Patricks Day. They are ALOT more I could name, but these are just examples. Hope I helped! Hey everyone! Heres a list of pins in CP games! This is a pretty long list. I have currently 78 pins and I'm 1,055 days old. Hope this helped! The astro blaser pin came out when the game came out and it was my first pin. Now I have ever pin since that one. There was a fireball pin from card jitsu fire. now that you menson it is pretty weird even though im a bit of a oldie of clubpenguin and i havent noticed it for a long time, great post mimo! well, personally i think that CP isnt really into subtle hints. although, i do have some ideas about that. something to do with water obviously... anyway, CHAOS OUT! I would like the puffle. But, GIANT Squid? Nah, I hate Big PINS. I don't think that they are actually up to something! I guess cp is just running out of ideas that they are just putting pins from here and there..or maybe theyre just too lazy..
-The queens in Snow White and Alice in Wonderland. -the evil old man in Up! -The evil people in Hercules. -the lady crook in The Rescuers 1! AND SO MUCH MORE..THEY ARE LIKE COUNTLESS! !and all of them led to killing,poisoning,burning,kidnapping,petrifying and using spells and so on! !AND ALL what we have seen from Herbet is that he wants to "BE WARM" and do something we don't know to th puffles??!!! This is so weird and for toddlers! !Who agrees?? Do u think we should protest??!! We dont want like Texas chainsaw massacre!!! !but we want something age appropriate!something teens and tweens and even toddlers would enjoy! Well thats a Great idea! During puffle parties they could make a puffle pin! The one you said about the colors well... thats ... umm... you see... a .. GREAT idea! Come up with more ideas and we will see if we like it or not! Yeah, that would be pretty cool, but i don't expect it since not everyone is a spy. That would be cool. Let's hope they make the member badge pins before i lose my membership! I would really like a puffle pin! A giant squid pin might even be larger than the large pins! Hey, Mimo, when do you add people to your mod list? I'm really wanting to become a mod and meet you at parties. Will i be able to make you my friend at this upcoming party? hey thats right! they get it from games! I don't know, but i hope he does pretty soon! i am in the soon to be mod list! I forgot about that Astro-Barrier pin! Also... Have you noticed that in every disneymovie except The Incredibles, 101 Dalmations and umm... One I forget at the moment- had at least one parent die before or during the movie... Or just be missing. Think about it. my friends talk about the old clubpenguin... The way CP is now... I think I like the old clubpenguin alot better. Kool!u came up with lots of things.I wonder if there is anymore? Hmmm, that is really interesting! lol. The frog pin is at the dock the same place that hydro-hopper is!!! wierd! I really want to meet you!! My penguin name is Mcfly4541!! Cool Mimo! I've been completely separated from the internet because of my vacation... TO DISNEY WORLD!!! i just got back! While I was there I bought the adventurer penguin plush from the series available ONLY at Disney World and Disney Land! You get THREE items from the coin! How cool is that? I also got some CP pins. (at Disney they sell collectible pins based on rides, parks, shows, characters, etc. there are also bands that go around your neck to attach them to.) They come with codes to. Cool, right? Well, see ya! Keep on Wadell-ing! Well spycomic29, you see mimo is a very thoughtful person! He is also fun to be with! Believe me he is the best! He has parties when thereare guessing games and stuff! Do you want to be a mod! well. You have to answer questions by other people! I like it... but I like crawfish better. For ppl who don't know, crawfish is a different version of shrimp! Mabe all of the game pins could be put in a game with pins. Yeah I noticed that ages ago, I just thought it was nothing because they have done that alot. I think mimo will do the list pretty soon. Please just put CPG MOD when you are modding! Thanks! I think almost all of us have spotted it in the game. There is also a very old pin that was one of the first. It was a pizza slice for Pizzatron 3000 that came out from February/March 2006 (I think from February the 24th to March the 10th). They might do a Shark pin from the Jet Pack Adventure game! The Fire Pin came just (well a while) before Card-Jitsu Fire! you know the Card-jitsu fire? i think the snow flake thing could mean Card-jitsu Ice. Hey Mimo777 how do you put the line under a comment to answer a question? Well look at that! Wow! Ooh, good idea Mango20! It would be like "Pin Scavenger Hunt"! Yeah weird right? But if you want to meet mimo, go to a quickee party, a party that Mimo hosts! He gives clues as to the setting of the party, and then he has the party! I'm not sure if u already know this, but on black puffle rescue game, if u follow the bubbles that the squid makes, you can find the secret door to the underwater room from when the caves first opened. 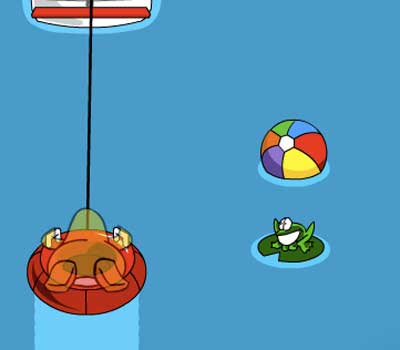 i just realised that the frog pin is in the dock but also in the water so its like the pin kinda comes into the game. weird right? Maybe, but that would be really hard. Ethanator said - Maybe there will be a Herbert pin. That would be cool XD. i agree. i think we should write a letter to them not start a protest maybe of we got mimo to help... he could get a ton of ppl to complain to disney.we need to stick up for club penguin in these times of negetivity... Mimo when you approve or dont approve of this post please help us. we must stop them.. THERE THE VILLIANS HERE! Hey guys! It's me, Jojojo33342. Well, remember when Club Penguin had a cactus pin?There was a cactus pin and then, when they released Card Jistu, there was a 11 water card that included a cactus! Dont put caps on and dont put cpg mod or mimo mod next to your name unless you are modding!